I got an ARC of this book through the YA Book Exchange a while back, and had loaned it to a friend. I got it back a few months ago, and just got around to reading it this past week. It was a longer book, over 400 pages, so I took a bit longer reading it. Plus, I had so many posts already planned, that it wasn't a big deal worrying about what I'd post on my blog. I'm not sure how much I liked this book. The rating I gave it on Goodreads was that "it was okay". I think the story had a lot of potential, and there were some really good parts, but at the end, I was left a little still not sure how I felt about it. The main character is named Velveteen Monroe. And while you may think she was named after the story of The Velveteen Rabbit, she was actually named after the fabric in the older movie theaters. Now there is something unusual about Velveteen, she is dead. And she is now in Purgatory because she must have some things she needs to complete before she can pass on to Heaven. She has a job of going out and helping to get souls to come back to Purgatory, ones that have possessed living people, which is against the rules. She has a crew made of two children, Luisa and Logan, not really children, that's just how old they were when they died, and also a boy named Quentin. When these dead people from Purgatory go out and possess the living, they cause horrible disasters to occur in Purgatory, called Shadowquakes. On one such disaster, Velveteen must take her crew out to find the soul causing this, and rescue them, as well as any other souls they may have stolen. On this trip they pick up a dead soul being stored in a crystal ball, who is a teen named Nick. Nick is described as basically a Abercrombie and Fitch model type of guy. 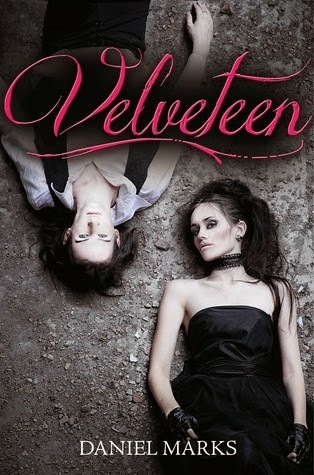 And while Velveteen is more of a goth girl, there seems to be an attraction between them. Which Velveteen doesn't want at first. You see Velveteen was murdered by a serial killer named Bonesaw. And she has found a secret crack to slip back into the living world, where she has gone and haunted him. Trying to save other girls from meeting her fate. Her goal is to one day be able to either make him kill himself while she is possessing him, or at least get him caught and put away so he can't do this to any more girls. And she's not supposed to do this. It is said that things like this could be what is causing all the shadowquakes. When they get Nick back, it seems he will be staying and working with Velveteen and her crew. And this is hard, because he doesn't seem to want to fight this connection, and it is against the rules for them to have relationships when they work together. Not only are those things issues, there is a group of rebel souls that want out of Purgatory, and they are taking advantage of these shadowquakes to move their agenda forward. As you can see there is a lot going on. I definitely rooted for Velveteen to go back ad take care of her serial killer. But some of the other stuff was confusing. They had to take their clothes from Purgatory off when they went through to the living world because they would get shredded on the trip there. But at first I wasn't sure if they were naked when they got to the world or what. Not sure how much it was actually made clear as I read. I liked the little back story behind the bad guy who was in charge of the rebels. But I still wasn't quite clear on exactly what they wanted to do. Yeah, they wanted out, but to possess people? That is mostly made clear at the end, even if it is still a bit unclear to me why they do it the way they do it. And I feel like there needs to be a sequel. I can't quite tell if the book ended and all this would be no problem anymore because of what was done or not. So let's say it had good parts, but maybe had too many details that I felt were just left open or hanging with no resolution. I don't see anywhere on Goodreads about a sequel, but I feel like a sequel might help me be more satisfied with this story. Once again thanks to both Spencer Hill Press and Netgalley for allowing me to read an e-galley of this book. And it was good to read it almost right after I finished the first one, Perfection, which I reviewed HERE. And I don't know if it was because I had just finished the first one and was getting to read right on, but I think this one was better than the first one. I mean I liked it better, not that I didn't like the first one though. So, here's the best summary I can give without too many spoilers for those who haven't read the first book. Our main character is again Ellyssa. She was able to save Rein with the help of his brother Woody. Unfortunately when they get back to the cave in Missouri the rest of their Renegade family called home, they find they have been discovered. There is a massacre in one of the rooms in the cavern. The only thing that gives them hope is that there aren't as many bodies as there should be. While they are trying to get their bearings and figure out where to go looking, one of their family shows up, Trista. At first they're unsure whether to trust her or not as she is wearing a Gestapo uniform. Ellyssa is unsure if she has betrayed them or is planning to. But it turns out Trista was saved by the cop from the last story, Dyllon, the one the crazy Gestapo lady after Ellyssa had almost fallen for. Rein is immediately ready to kill Dyllon when he sees him, remembering how Dyllon had stood by while Ellyssa's sister Aalexis had tortured him. But Trista is able to convince them to give him a chance, along with help from Ellyssa who is able to read his mind and see whether he plans to betray them. They are taken to the house of one of the supporters we met in the last book. They stay there while they try to figure out where the other survivors from their Renegade family have been taken. Ellyssa was sure that when they blew up The Center in their escape at the end of the first book, that all of her siblings were dead. But she is wrong. Aalexis and Xaver survived. And the lat thing Dr. Hirch, der Vater as they call him, told Xaver, was to protect Aalexis at all costs. With her being able to control things with her mind like she can, she is the most important of all the children the doctor created. Aalexis wants to continue her father's work, but she also wants revenge on Ellyssa for killing him. But she can't just kill her, because they need her DNA as part of the next set of children, the more perfect children with all of their abilities. As Xaver and Aalexis mature, they begin to undergo some of the same issues with emotions that Ellyssa had experienced, something that they had always been told was weakness. But Xaver convinces Aalexis that their father was imperfect, so he must be wrong about this. He used the example of how far Ellyssa would go to save this imperfect boy she was in love with, Rein. The survivors are in a concentration camp. Sent there on purpose, and Aalexis is going to use them as bait to try to get Ellyssa where she wants her, and to get her revenge. There will be betrayal, and lots of hard traveling and planning to try to save their family. And we will even see her friend Mathew, the Renegades' doctor in the first book, deal with Aalexis and other Nazi's at the concentration camp in his own bid to survive and save his family. It all ends up at the camp, with a conclusion that doesn't quite end it. It leaves us open and ready for the next book. Since other characters from the first book that we got to read from their point of view are dead in this book, we get some new ones besides Ellyssa. We get to go into the insane mind of Aalexis, and see how she reacts to all of this, and how she schemes to complete her father's plans. And as I said, we also get into Mathew's mind as he tries to make it in the concentration camp. I feel like we got more background and details on the outside world, as well as some of the history between the World War II and the current time, since Hitler won the war. December 7th is Ellyssa, Aalexis, and Xaver, as well as the other children who are no longer alive's birthday. In honor of the day of the Pearl Harbor attack. According to this alternate reality, that is when the war turned in Hitler's favor. I found that interesting, and hope to hear even more about that in the next book. Which I will be waiting on impatiently, as well as keeping my eye open for when an e-galley of it might be available. The title of the first book, Perfection, fit well as we learned about the perfect children like Ellyssa and her siblings, and the doctor's goal to truly create a perfect race, even at destroying many of those who were currently close to the ideal, but not truly there. And the title of this, Flawed, fit this as well. 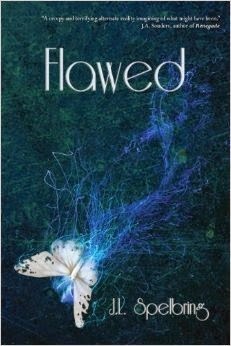 Aalexis and her brother becoming "flawed" as they began to feel more and more emotions, which was totally not part of the goal their father had. 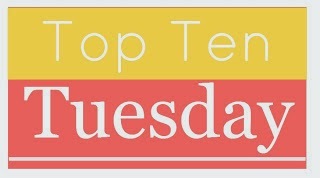 Who are the 10 authors that I own the most books from? I will list these kind of in order, as I get to number 1, it will be the author I have the most from, whereas at number 10 will be ones that I have less. I have some authors that have a whole shelf all to themselves, and I have double stacked in those cases as well, because otherwise, they might need almost a whole bookcase to themselves. The bottom 5 are ones that I might be off by one or two books in how many I think I have. I tried to remember how many I had by them and tried to look on the shelves, but it is always possible that they are loaned out to someone at the moment. And there could be other authors that I just didn't think of off the top of my head that could belong in my bottom five of the top 10. And if I have my picture with that author, I will share! And for the top 3 or 4, I have pictures of their shelves. 10. James Rollins - I believe I have about 10 of his books. 9. Robert McCammon - I think I have about 11 from what I could see on the shelf. 8. Lemony Snicket - I have 14 of his books I think. 13 for sure in The Series of Unfortunate Events. I have missed out on meeting him both times I've been at BEA. 7. Anne Rice - I have at least 15 of her books. 6. Tim LaHaye and Jerry B. Jenkins - I have to combine these two because I have 16 books that the two of them collaborated on in the Left Behind series and prequels. I'm also excited they're going to do another movie based on the book, even as much as I do love Kirk Cameron, the first movies made were kind of cheesy, and definitely low budget. 5. Because they are written by lots of different authors, I will put them below the top 4, even though I probably have more, which you can see in the picture below, but I am going to count all the Buffy the Vampire Slayer books as one of the top 10, as many of them were written by some of the same authors: Nancy Holder, Christopher Golden, and Mel Odom to name a few. I met Nancy Holder at the RT Convention in 2013, but forgot to have my friend take my picture with her. So I will share a picture below of me with two characters from the tv show, Xander and Glory. Four Houses by Victoria Scott E-book Released! Review: XY by Shanta Everington and Giveaway!